The European Space Agency released data from the Gaia probe. Wow. Look at the density! The first catalogue has more than a billion stars. Clearly, it's not done. 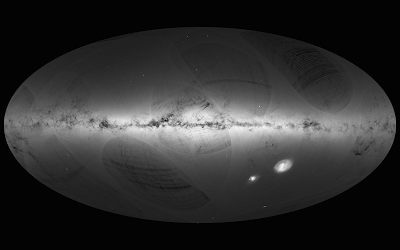 In addition to plotting the star positions, an unprecedented number of distance measures were made, making for the most elaborate three-dimensional map of the Milky Way ever produced. See the full article at the ESA web site.